Welcome to my kitchen! I live in beautiful Northwest Arkansas with my husband of 20 years, John, and our 3 children: Kate, Abby and Alex. Before we had kids, I was an MBA working in Human Resources and John was a Physician. We ate out every night, stayed up past midnight, spent our weekends at the lake with our dogs, and our vacations traveling to far away places. Our lives are a little different now, but we wouldn’t change a thing! John gave up medicine several years ago to pursue his love of entrepreneurship and I am now a full time stay-at-home mom and part time blogger. I started really cooking when our oldest daughter was born, only because it was suddenly impossible to go out to eat. I don’t have any sort of culinary training, so I had to learn as I went along. I watched a lot of Food Network while I rocked the baby, and I read every cookbook I had cover to cover. It’s taken years for me to learn not just how to cook, but also what to cook. What you’ll find here are easy, weeknight friendly recipes approved by my family. I throw in some desserts here and there, too! 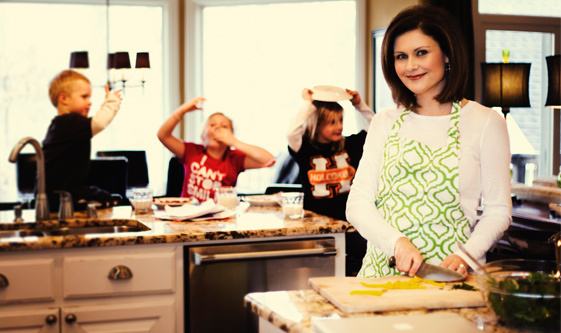 I hope my blog will inspire you to cook something healthy and delicious for your family! Copyright © 2012 Our Everyday Dinners - This is an easy recipe for how to make About.